First, the good news. Unlike Chinese, which draws from a set of thousands of characters, Arabic has an alphabet. The alphabet itself is not difficult to learn to read, and to write - even right-to-left. There are just twenty-eight letters. It has been said, too, that those good at math can conquer Arabic grammar. Related words are often simply different forms derived from the same root. If you know that "kataba" means "to write," you may deduce that "kitaab" means "book" and "kaatib" means "writer." 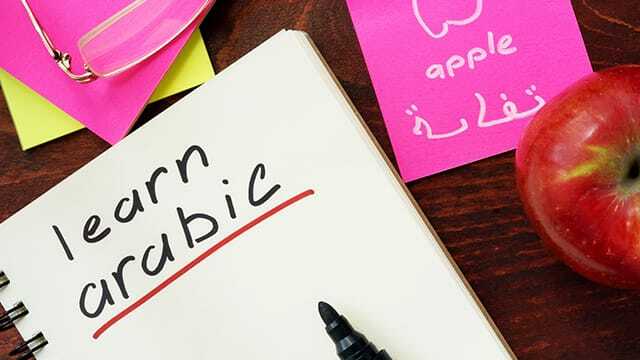 Once one knows the forms, rudimentary Arabic can be similar to algebra – itself an Arabic word, from "al-jabr," meaning "reunion of broken parts." The challenge begins when you realize that most of those twenty-eight letters have four different forms, depending on whether they stand alone or come at the beginning, middle, or end of a word. Verbs, too, are tricky, even as Arabic has just two verb tenses. Although the verb system is simpler than those of other languages like Spanish, the language has different endings (or prefixes) for the different forms. Many masculine nouns have plurals that don't follow a simple rule (like adding "s" in English). Number-noun agreement is also somewhat complex, with all sorts of different rules depending on the number. Vocabulary can be tough for learners with an Indo-European language background. Arabic belongs to the Semitic family, which includes Hebrew, Amharic, and Aramaic. These languages have few cognates with English. The cursive Arabic script may make words look impenetrable to the uninitiated reader. A particularly demanding aspect of Arabic script is that in Arabic, as in Hebrew, short vowels are not included when writing. Beginner's textbooks annotate these vowels as little marks above and below, but moving beyond them requires being able to see whole words at a time. Finally, there are major differences between written and spoken Arabic, with no universally agreed method of transliterating Arabic into English. Extra care has to be taken with pronunciation. The written language is taken from the Classical Arabic used in scripture. It has today been updated to Modern Standard Arabic, or "fus-ha" (literally, "the purest"). The distinction between the two is akin to that between the English of Shakespeare and a modern newspaper. However, no native speakers actually use Modern Standard Arabic. Traveling through all twenty-six countries which speak Arabic natively, almost four hundred million people in the Arab world will understand you; but you, in turn, might find it hard to comprehend their replies. If, as the British Council cautions, you try speaking "fu-sha" in the souq, unless you can throw in the odd bit of colloquial Arabic to pitch yourself at the right register, you risk coming across as though chatting to Cretian locals in Ancient Greek. Indeed, spoken Arabic has evolved constantly into a variety of dialects. Algerian, Moroccan, and Tunisian Arabic dialects are full of French words. All spoken Arabic is colloquial, so that while Arabs from Morocco and Syria could read each other's newspapers, they may have trouble carrying out an intelligible conversation. Travel phrase-books tend to use Egyptian Arabic, which is understood throughout the Arab world due to Egypt's prodigious output of films, television programs, and music. This does not always make for smooth conversation. A visitor to Sudan, for instance, might refer to a camel as "gamal." However, the "g" in Egypt is pronounced as a soft "j" in Sudan. Hence, to the Sudanese, the camel is "jamal."